Facebook Quizzes are fun right? Or are they a back door to your account? Online quizzes are fun, facebook quizzes are fun, but we need to be careful. If you are taking a quiz and it asks you to login with facebook, avoid that quiz! It’s just not worth it. You can find other quizzes that don’t require you to login, anything that needs your login is getting too much information. This can lead to far too much information about you being taken by the company writing these quizzes. They can sell that information or use it for purposes you don’t agree with. Worse yet this is one of the ways facebook accounts can be hacked! Soon your account will be trying to sell Oakley sunglasses and Ugg boots to your friends by tagging them or inviting them to events. No one wants that. I’m not the only one talking about this, and this isn’t new information. Way back in 2011 PC Magazine was telling people to be careful. Five years later and article after article are being written about the dangers, in this Beta News article they point out how evidence that these quizzes are essentially malware isn’t persuading anyone to stop doing them and giving away their information and accounts. Fight Identity Theft has a really great article that not only tells you it’s bad, but it shows you how these quizzes work and how they steal your information and account access. They even have a petition to make facebook crack down on this stuff. I encourage you to read these articles and remember, no quiz will be fun enough to risk losing your facebook account over. 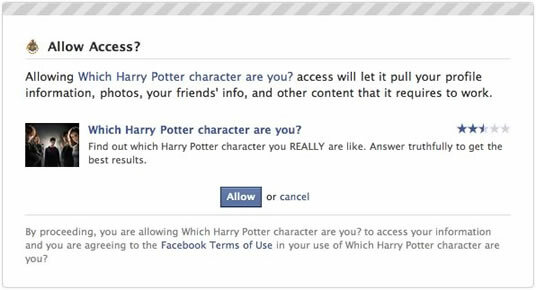 Besides, you already know in your heart which Harry Potter house you belong in, you don’t need a quiz to tell you that. Expired Domain? DON’T LET THIS HAPPEN TO YOU!!!! Just this week three of my clients experienced an expired domain. What’s a domain? It’s the URL that is your website. As in www.mywebsite.com or in my case, Moran Media’s domain is www.remoran.com. This happened on three different platforms. Each time it was something silly, like not having auto renew enabled, having old credit card information, or insufficient funds in their account. Depending on who they were registered with the repercussions were different for each. One had a grace period where they had time to correct the information and get their domain back before their site went down. Another missed the notice their transaction failed and only noticed when their site went down. Another got a notification as soon as the transaction failed but their domain registrar turned off their site right away without giving them a chance to correct the information. For some people this could be disastrous. Most domain registrars give you a grace period to get everything in order, some may not. Make sure you know what your registrar will do if you miss a payment. If you don’t catch it in time your domain could be sold off to the next bidder, this is not something you want. You’re reputation could be ruined by a competitor or a detractor, your site rankings could be harmed, your customers might think you have closed. Make sure you know the rules of your domain registration and it’s a company you can trust. What’s their customer service number if you have an emergency? Make sure your information is accurate and up to date with your registrar. Email goes to an account you check daily. Credit Card information is always up to date. Set your account to auto renew. If you can, use a credit card rather than a bank card or paypal so it can renew without much effort from you. Mark your calendar for renewal time. This way you can change the card that is used to pay if you need to. You can pay for multiple years if you like. You can add a promo code or coupon code and save some money. In the old days of the internet there were a lot of scams. You’d get a renewal notice from a company, pay for the renewal and then suddenly you switched registrars. Thankfully that scam is seen a lot less these days, but it’s still good to note who your registered with. This will save you headaches later. I always advise keeping that information with your passwords and all of your other business information, so you always have it. Have you ever had your domain expire? 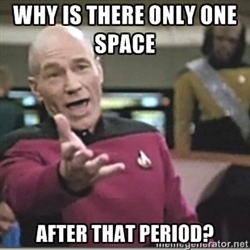 Marketing Monday: The Big Debate – How many Spaces After a Period? 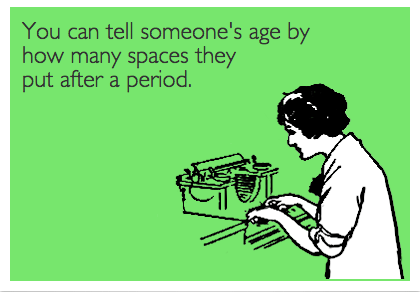 This is a meme I’ve seen around, and it’s true, if you learned to type on a typewriter you use two spaces. I have good news, you’re not wrong, no matter how many spaces after a period you use. Everyone thinks there is a right way and a wrong way, but in truth, like language it’s fluid. When handwriting, we learned to put enough space after a period so we can see where the sentence ends. Remember using your pinky in grade school as a marker? When the Gutenberg press was introduced the spacing was set manually and printers made sure to do the same thing, they gave extra space at the end of sentences. The story I was told, and learned from many sources is this: When the advent of the typewriter came about, everything changed. Because typewriters used monospace people needed to put two spaces after a period. When computers came about most programs and printers were monospaced, everything was designed to emulate a typewriter. Later developers made it so after a period one and a half spaces would be shown so people could stop pressing the space bar twice, it was more efficient and more accurate to how layout was done in traditional printing. Problem is, that’s wrong! The article on Heraclitean River “Why two spaces after a period isn’t wrong (or, the lies typographers tell about history)” explains that the shift is not due to the typewriter, but due to publishers looking to save money on paper by removing extra spaces. They further say that this trend is only about 60 years old. Regardless as to why the shift, generations have been trained to hit space twice after a period, it has become habit and even more, muscle memory. I learned to type on a typewriter, and then later a Commodore 128. Two spaces were still very much a thing and a necessity. I would not be able pass my level of Stickybear Thump without putting two spaces after the period, and any paper I turned in would be marked wrong by teachers. Now as a graphic designer and having worked in the print field for almost two decades I know that the industry standard isn’t two spaces, and what a printer expects. I’m a two spacer who understands that I don’t need two spaces anymore. When laying things out for print my career has been filled with going through articles and reams of text, looking for the extra spaces, removing those extra spaces after a period so it is all uniform and works well. Most often the text I’m given has been written in Word. Word and other word processing programs have lovely shortcuts that automatically see two spaces and make them 1.5 and see one space and make it 1.5. Along with a bunch of other things where it corrects your typing. The problem is that when I import it into my layout programs to get it ready for a printer, all those formatting corrections come out as the raw typing (2 space=2.5, 1 space =1.5) and sometimes even ads even more spaces in. So I have to fix it. There are many people who will tell you that two spaces is just plain wrong, and sometimes they will say it a bit harsher than they should. This article on Slate “Space Invaders” has some good points but the tone is judgmental and much of their history is wrong, or at least contested by other sources. One more thing to consider is that we have muscle memory of two spaces and developers have started taking advantage of it. Pull out your smartphone or tablet, start typing and at the end of a sentence tap the space bar twice, what happens? It puts a period and a space in for you, it formats it perfect for you. Today, most people use their phones more than their computer*. I believe that having this shortcut on smartphones is an indication that the split between typing one or two spaces is still divided and will be going back and forth for a few more generations to come. Everyone wants to be right, so who is right? Well when typing in Word, it doesn’t matter. When laying out for print, it matters and you need to only have one space (which displays as 1.5). When typing a blog post, whatever you prefer is best. When writing a paper or something that requires you to abide by a stylesheet, go with that stylesheet. Chicago style says one space (now) and MLA says two. There are many more stylesheets to reference, so always check. When composing an email, check with your company’s stylesheet, if they don’t have one, then just be consistent. I know in the military it’s always two spaces, and they have their own reasons. For me, since I work in print, I go with one space, it saves my customers money and it’s the current trend. So my blog posts, emails, and everything I use one space. Or at least I try to, sometimes my muscle memory slips. What do you do? 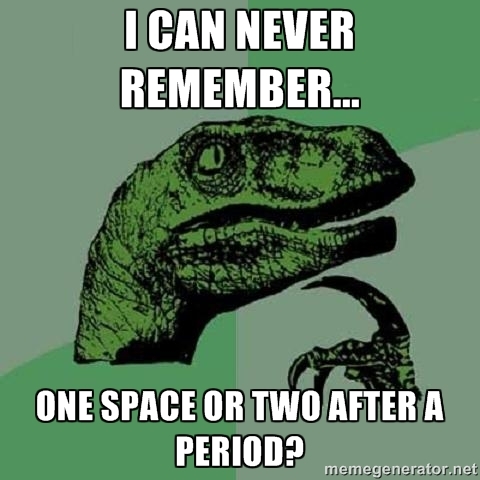 Are you a one spacer or two? 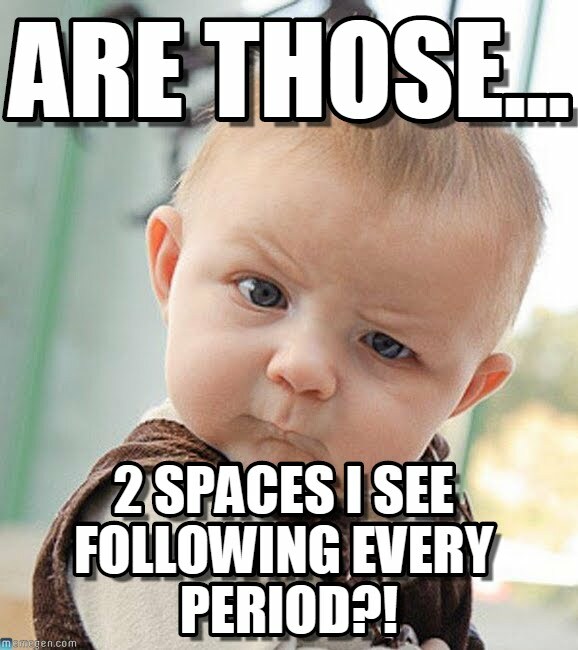 Hopefully I provided you with enough information to defend your position the next time someone wants to argue about how many spaces go after a period. BridgeMassage.com – Full site design, layout and management. 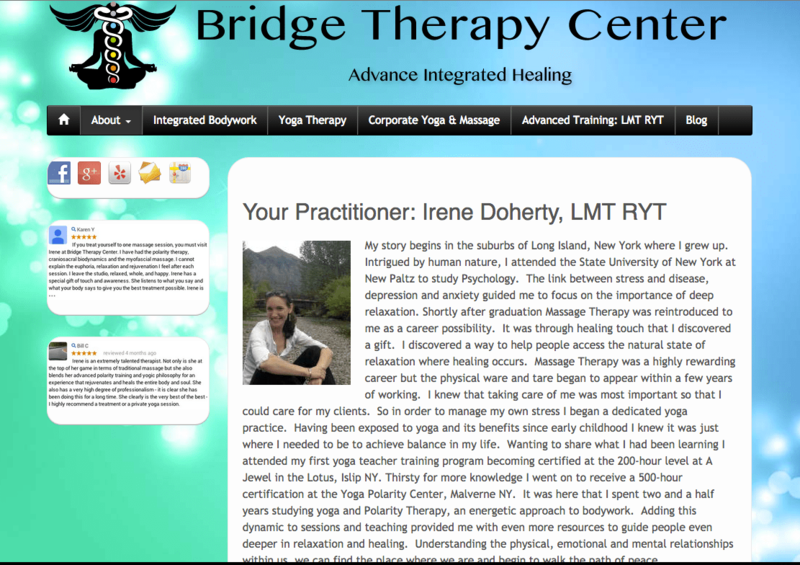 Today I’d light to spotlight one of my customers, Bridge Therapy Center, found at bridgemassage.com. Bridge Therapy is a small business in Colorado. Owner Irene has put her personal touch into her brand. She offers Yoga training and Integrated Bodywork (Massage Therapy), so it’s important to put a face to these types of services. With her blog she is able to convey her point of view and make future customers more welcome to visit the center. By utilizing the social media Irene was already using she was able to reach people on facebook and draw customers to her site. I always say, only promote on social media you actually use, otherwise it’s wasted energy. People want a conversation, a relationship; they don’t want you screaming ads at them. 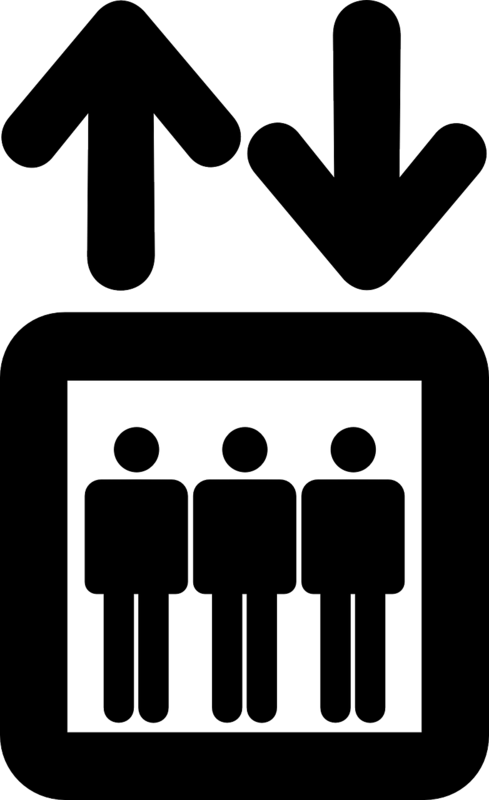 Marketing Monday: What’s your elevator pitch? Elevator Pitches, often meant to describe an idea, but what about describing what you do? Last week I listened to a podcast where the hosts were talking about describing what you do in the form of an elevator pitch. If you listen to the podcast (which is fairly short and worth listening to) you can hear how simply stating your job title can lead to confusing information and awkward conversation. In this podcast they demonstrate how to turn this simple question into an engaging conversation. Normally when people ask me what I do I say “Graphic Design and Educational Consulting,” which is a mouthful and doesn’t illustrate what I do to anyone. Coming up with a title for myself is hard enough since there is so much that I do. I build websites, specialize in print publication, create art, am a photographer, manage and teach how to use social media for your organization, teach computer applications, broadcasting, work with schools to implement 21st century tools with project based learning, logo design, branding, you name it. So today I’m going to try and pitch myself, and you can tell me if it works. What do you do? I have a great job, I help charities and businesses focus on their mission. How do you do that? I give them the tools they need to handle all of the things that aren’t their primary concern but are essential to carry out their goals. I make websites for people who don’t know how to code, make it so they can blog with the same ease they use Word. I do the grunt work of publications and printing so they don’t have to think about it, and everything they put out looks professional and encourages people to use their services. I help with making sure their staff are well trained and can use everything I design for them. I make sure they they have complete control over everything pertaining to their organization, so they can focus on the stuff they do best. So how does that sound? Is it more interesting? Would it make you ask me more questions about my job? What’s your elevator pitch? Chuck Chat Freestyle: What’s your Elevator Pitch? 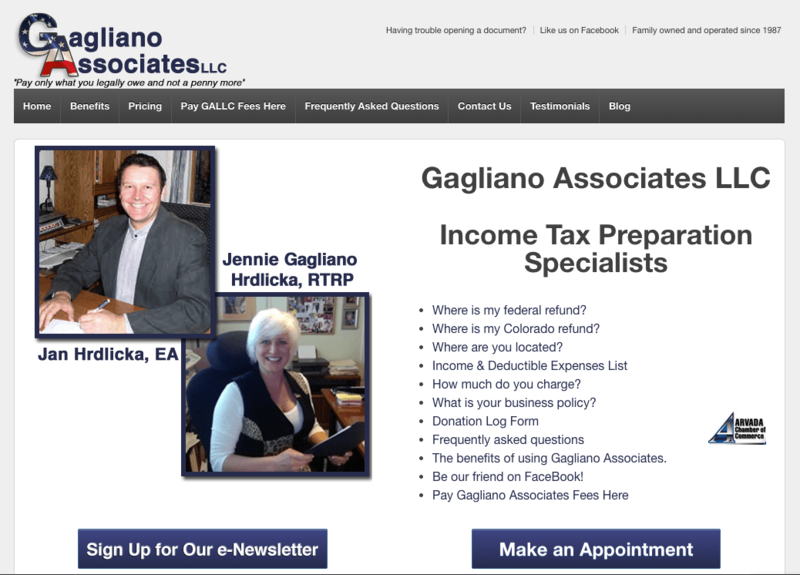 Today I’m showcasing one of my clients Gagliano Associates, LLC. These tax pros out of Colorado first contacted me to redesign their website and with this redesign they branched out into social media and blogging. I always tell my clients that adding a blog and putting new content on their site that can be searched by google is a good move. I also tell them that social media is a tool they can use to engage their customers. Gagliano Associates took this advice and ran with it. If you go to their website you can find all sorts of information that you need, but on their blog they are always posting useful information to keep you up to date with the latest financial tips. On facebook they engage their audience and put a personal touch to their small business. Having operated since 1987 they have been able to stay up to date with the changes in technology as well as they have stayed up to date on the latest tax codes. If you’re in Colorado, check them out. I needed Rebecca to help get a new website live. I was having major issues with <my webhost> and had spent countless hours on the phone trying to fix it. Rebecca was extremely thorough and was able to get the site up within a few hours, on short notice. She continued to reach out after it was live to make sure everything was working the way I needed it to. I will definitely be using Rebecca for any additional site changes that come up. We hired Rebecca with Moran Media after we could no longer do our website on our own through FrontPage. We found Rebecca through a Facebook post. She was able to see our vision and create a website that provides all our needs and more. She also added functions that we haven’t done in the past like blogging. A great addition to our presence on the web. Rebecca also created awesome logos for our company, something we didn’t have before! Rebecca is thorough, professional, and does quality work. She thinks outside the box and really listened to what we needed and went beyond our expectations! She even gave us advice on how to use our new site to grow our presence on the web. We highly recommend Rebecca and Moran Media for any of the creative needs you or your company may have.